Himachal Pradesh has demanded a compensation of Rs 4,249.45 crore from Punjab and Haryana under the Supreme Court verdict on the Bhakra Nangal and Beas projects. Assam Government has decided to seek CBI investigation into the current spell of communal violence involving Bodo tribe and Muslims in the state even as a fresh incident of shooting in violence-affected Kokrajhar district claimed three more lives while another body was recovered, forcing the authority to re-impose indefinite curfew in Kokrajhar. The Australian Police has announced a reward of Rs 57,00,000 (1,00,000 Australian dollars) for information leading to the arrest of a Chandigarh-born boy who fled after allegedly running down two men in Melbourne in October 2008. 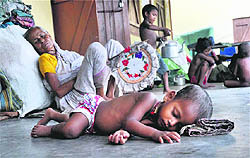 A major crackdown on international rackets involved in cross-border trafficking of girls and women for prostitution and other illegal activities from the north-eastern states and Nepal by the Central Bureau of Investigation’s (CBI) special anti-human trafficking has led to the rescue of 18 girls and woman at Dwarka’s Umrahi village here. Union Science and Technology Minister Vilasrao Deshmukh, who was undergoing treatment for a liver condition at Breach Candy Hospital here, was rushed to the Global Hospital in Chennai late Monday night in a critical condition. A Bench comprising Justices AK Patnaik and SJ Mukhopadhaya today granted eight weeks’ time to the Centre for deciding the compensation amount in the light of Himachal’s claim and the averments of Punjab, Haryana and the Bhakra-Beas Management Board (BBMB). Senior counsel JS Attri, arguing for Himachal, also took exception to the delay on the part of the Centre in working out the compensation amount under the September 27, 2011 SC judgment. The apex court had directed the Centre to calculate the amount due to Himachal Pradesh within six months which was over on March 27, 2012, he said. “We can’t give 12 weeks. As a last chance, we are giving eight weeks,” the Bench said and asked the ASG to expedite the process. Interestingly, Himachal has submitted to the Union Power Ministry its “revised claim” for Rs 4,249.45 crore under the SC verdict only on July 7, 2012, much after the six-month deadline. Himachal has claimed Rs 2,724 crore on account of the Bhakra Complex, Rs 1,033.54 crore in respect of Dehar Power House and Rs 491.89 crore with regard to the Pong Power House. HP said its claim was based on average purchase rates of the quantum of power which would have been available as its actual share from BBMB projects during 1990-2011, the period for which data was available. For the period 1966-90, the claim was based on annual global rates (BTPS rates) adopted by Northern Regional Electricity Boards for all inter-state exchange of energy. In the September 2011 verdict delivered on a suit filed by Himachal in 1966, the SC had declared that the hilly state “is entitled to 7.19 per cent of the power of the composite state of Punjab from the Bhakra-Nangal Project with effect from November 1, 1966,” up from 2.5 per cent till then. 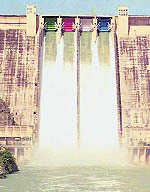 The SC had also raised Himachal’s share in the Beas I project from 15 MW to 5.752 per cent from the date of commissioning. From Beas II, HP would get 2.984 per cent against ‘nil’ share all these years. The apex court asked Punjab and Haryana to pay the compensation, sharing it in the ratio of 60-40 per cent, for enjoying a greater share of electricity from these hydro-power projects at the cost of Himachal. Feeling aggrieved, both Punjab and Haryana had sought a review of the SC verdict which was rejected on March 29. The Centre has informed the SC that it had already sought the relevant figures from the BBMB, Punjab and Haryana. A three-member committee comprising the Joint Secretary (Hydro, Ministry of Power), the Chairman of BBMP and the Member (Hydro) of the Central Electricity Authority was busy finalizing the compensation on the claims and counter-claims. Decreeing the suit partly in favour of Himahcal in September 2011, the SC had dismissed the pleas against the Centre, Rajasthan and Chandigarh and HP’s demand for 12 per cent of free power claimed on the basis of the projects being located within its territory. The police said three persons were killed and two others injured when some persons opened fire on a group of people at Ranighuli village late on Monday night. A body was recovered from a field in Rajapara area in the district. With these deaths, the violence toll has mounted to 73. Expressing grave concern over the fresh incident of shooting, Chief Minister Tarun Gogoi said he had issued stern instructions to the police and the district administration to confiscate all the illegal weapons available in the violence-affected Bodoland Territorial Council (BTC) districts and adjoining areas. In a way, the Navy Chief, who retires on August 31, made it clear that the original plan of having three nuclear-powered submarines carrying nuclear-tipped missiles needs to be fast-tracked. The 6,000-tonne Arihant is being built at Vishakhapatnam. 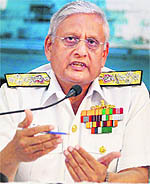 “We are confident that in next few months we will be able to put the submarine out at sea,” said Admiral Verma. A nuclear-powered submarine is a strategic vessel as unlike the diesel-powered ones, it can lie submerged underwater for several days avoiding the enemy. Recently, the Russians leased a nuclear-powered submarine, INS Chakra, but international rules prevent India from deploying nuclear weapons on board the Russian vessel. Puneet, a learner driver, was charged with culpable driving and negligently causing serious injury following a collision in Melbourne, which resulted in the death of Dean Hofstee, a 19-year-old student. His friend Clancy Coker suffered multiple injuries in the accident. The two were walking when they were struck by the vehicle being driven by Puneet. Puneet was said to be driving at 148 km/h in a 60km/h zone. His blood alcohol reading was 0.165: more than three times the legal limit for a fully licensed driver and as a learner driver it should have been zero. Puneet was granted bail on strict conditions, including the surrender of his Indian passport, but he failed to attend his August 2009 court hearing in Melbourne. The authorities later discovered Puneet left Australia on June 12, 2009 using the passport of another Indian student, Sukhcharanjit Singh. In March 2011, Singh pleaded guilty to perverting the course of justice. Singh was convicted and sentenced to 2.5 years imprisonment. Hofstee’s parents have now made an appeal for information about Puneet, who is believed to be living in India although his exact whereabouts are unknown. Australian High Commissioner to India Peter Verghese welcomed the announcement by the Victorian Government of reward leading to Puneet’s arrest. The Australian Federal police based in New Delhi have been working with the CBI in relation to the case. While some documents and fake Nepalese passports have been seized, no arrests could be made with offenders fleeing the spot where a rescue team comprising 10 officials of CBI and four from NGO Shakti Vahini was believed to be on the job. CBI had kept the operation under wraps to the extent of not involving the local Delhi police, not taking any chances, thus clearly pointing out how organised the trafficking business has become in recent years. What is more worrying is that the issue of fake passports has been a major challenge for the Indian security agencies, especially as regards Nepal, which remains generally ignored by the Indian government owing to cordial relations it shares with it. Deshmukh, 67, suffered kidney failure following cirrhosis of the liver. His family chose to shift him to the hospital in Chennai which is known for liver transplants. Overseas Indian Affairs Minister Vayalar Ravi has been given additional charge of Deshmukh's portfolio.